This book is written for anyone who is doing work with an intention to make the world more sustainable and hopeful—all in all, a better place—and who, through this work, is exposed to the hardship, pain, crisis, trauma, or suffering of other living beings or the planet itself. It is for those who notice that they are not the same people they once were, or are being told by their families, friends, colleagues, or pets that something is different about them. This book is a navigational tool for remembering that we have options at every step of our lives. We choose our own path. We can make a difference without suffering; we can do meaningful work in a way that works for us and for those we serve. We can enjoy the world and set it straight. We can leave a legacy that embodies our deepest wisdom and greatest gifts instead of one that is burdened with our struggles and despair. You will find in the pages that follow that Laura has a keen understanding of trauma and the responses to it. This is a book written by someone who has walked the path and knows firsthand what trauma brings and demands of those who walk that path. Her honesty, humor, and no-nonsense approach make these vital topics accessible to all of us. Even the most experienced trauma worker will find a refreshing perspective here. Her idea of trauma stewardship is a great gift to our field. It erodes the artificial line between sufferer and helper. It recognizes that trauma has impacts that can be named and managed. Trauma stewardship calls into question whether the means of exposure (direct or indirect, through relationships with those directly exposed) has any relevance to the impact of the trauma. Most of all, trauma stewardship calls on us to remember that it is a gift to be present when people deal with trauma; it reminds us of our responsibility to care and to nurture our capacity to help. You will soon read Laura’s claim that she brings no new knowledge to this calling. This is far from the truth. 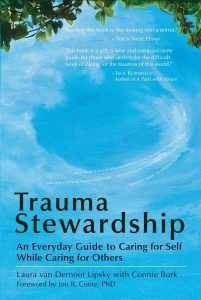 Not only is trauma stewardship a new formulation, but in ways that no other book or trainer has done, Laura links the key components of responding to trauma together in a way that is seamless and natural. One cannot go away from this book without understanding the relationship between oppression and trauma, the importance of purposeful action to protecting others and self, and the vital role that spirituality plays in protecting us from and managing trauma’s impact on our own lives, as well as on the lives of our clients and friends. It interests me that Laura comes to this appreciation of the role of spirituality from walking the path, although increasingly this is also a finding from research on vicarious trauma. Laura directs our attention to the impacts of trauma work on those who help and witness. Rather than pathologizing those of us who experience these reactions at one time or another, she helps us to understand our feelings and behavior as natural responses that flow from our humanity. In the same way that oils splatter on the painter’s shirt or dirt gets under the gardener’s nails, trauma work has an impact. As psychotherapists, we know that when the sources of anxiety go unrecognized, the anxiety cannot be managed. When that is the case, not only we but also our clients may suffer unnecessary distress. Laura gives us a range of possible emotions, ideas, and behaviors that can indicate that the work is taking a toll. Perhaps the greatest gift this book gives us lies in the sections on finding compasses. Instead of producing a cookbook, Laura takes us along on her own journey. The Five Directions invite us, it seems to me, on a single direction that is inward so we can again go outward to the work. I haven’t told Laura until now that when I first read this, I was angry. “Laura, for heaven’s sake”—maybe the real words were a bit stronger—“tell me what to do!” Then I came to understand, as I took the deep breath she invites her reader to take, that the answer for her cannot be the answer for me. She gives us a compass, but each of us has to find the direction. Those of you who are about to read this book are at the trailhead of a path that holds great promise for you, for your work, and for those whom you are privileged to work with. In an age when the same ideas get repeated until they lose any meaning, this is a book with fresh ideas. Unlike cookbooks or manuals that invite quick responses that have not been thought out, this book invites us on a journey. On that journey, we are invited to take a fresh look at why we do the work, and how our work must be contextualized in efforts to end oppression and privilege. We are reminded that the work has inevitable benefits and challenges, that we are stewards not just of those who allow us into their lives but of our own capacity to be helpful, and that a mindful and connected journey, both internally and externally, allows us to sustain the work. We are in this work together, all of us. Our best hope is to understand that it is a long journey. We need to take care of ourselves and each other. Laura has given us a great compass and map to help us on our journey. Reading this book is like looking into a mirror. We will see ourselves much more clearly, will understand ourselves much better and will come up with better ways of being It and of doing It. Compassion, yes Compassion is Happiness itself. Enjoy.